Keep fresh mint (Mentha spp.) at your fingertips all year growing in pots on a windowsill, porch or in a sunny room. Mint, which grows in U.S. Department of Agriculture plant hardiness zones 4 through 9, depending on the variety, is available in a variety of fresh, flavorful types. Look for the tried and true standbys like peppermint (Mentha × piperita), hardy in USDA zones 5 through 9, or try one of the exotics like chocolate mint (Mentha × piperita f. citrata "Chocolate") or lemon mint (Mentha × piperita f. citrata), both hardy in USDA zones 5 through 9. Chop fresh mint into salads, muddle in drinks or nibble straight from the windowsill. Grow mint in an 8- to 12-inch-diameter pot with at least one hole in the bottom for drainage. Mint is particularly sensitive to wet feet, growing in a soggy environment where water can build up around the roots. Plastic and terra cotta pots both work well and are readily available, as do Metal, wood and glazed clay pots. Use potting soil mixed with compost and perlite to add nutrients and improve drainage. Mix two parts potting soil with one part each perlite and compost. Clean garden sand and vermiculite both work in place of perlite. 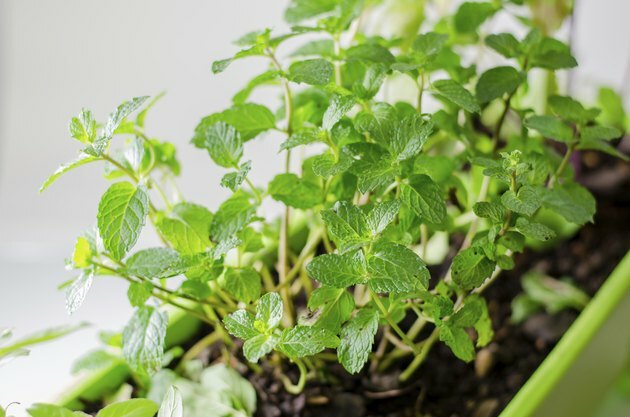 Keep the potting soil consistently moist when growing mint indoors. Watering frequency depends on growing conditions. For example, unglazed clay and wood pots dry out faster than plastic or glazed clay pots, and potting soil dries out faster when it's hot and sunny. Feel the soil and water if it starts to feel dry 1/2 to 1 inch deep. If you use a tray to collect excess water, empty it after every watering. Grow mint in a spot that gets bright direct light for at least six hours per day. Indoor plants will lean toward the sun. To keep them growing straight, turn pots once a week to expose both sides to the sun. Fertilize mint twice a month with a liquid or water-soluble fertilizer. For each plant, use 1/2 a teaspoon diluted in 1 gallon of water. Soak the soil until it is saturated through to the bottom with the diluted fertilizer. After potting up a new mint plant, wait three weeks before you begin fertilizing regularly. Over time salts from water and fertilizer can build up in the soil, potentially damaging mint plants. If this starts to happen, you'll notice white deposits on top of the potting soil. Flush salt out of the potting soil by moving the container outdoors or to a sink or tub, then running 8 to 10 gallons of water (for an 8- to 12-inch-diameter pot) through the soil, allowing it to drain freely from the holes in the bottom. Repeat monthly. Although generally hardy, occasionally mint succumbs to diseases, particularly mint rust. Keep plants healthy by avoiding overfertilizing -- which can stress plants -- and watering the soil without getting leaves wet. If rust does develop -- characterized first by rust-orange colored spots on stems and leaves -- get rid of those plants. Once advanced, mint rust causes leaves to turn black and die. Sanitize containers by scrubbing them with household disinfectant and adding new potting soil before replanting fresh mint plants. Air circulation is important indoors. Keep pots in an open screened-in porch or near open windows. Alternately, set up a fan on low near the plants.